The follow-up from this year's Desire, the Desire HD is better-suited to larger-pawed humans. As expected, it has a 4.3-inch display and 8MP camera with dual-flash. Capable of shooting video at 720p resolution, it's the European version of the EVO. 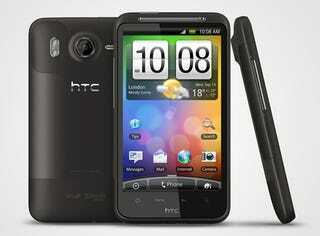 Running Android 2.2 (Froyo), the Desire HD has a 1GHz Snapdragon processor, and runs on 768MB of RAM. Internal storage is 1.5GB, expandable via the microSD card slot. That 4.3-inch display is actually a WVGA TFT LCD panel, with the overall size of the phone coming in at 123 x 68 x 11.8mm and weighing 164 grams. The aforementioned 8MP camera shoots video in 720p, and has a dual-LED flash, for even brighter lighting—however stark it might be. The battery might not be the best we've seen in an Android phone, with the Desire HD using a 1230mAh battery, but hopefully the newly-improved Sense UI will be kinder to battery life. —To see hands-on photos and opinion of the Desire HD, head on over here.